In retrospect, this probably wasn't the smartest thing I've ever done. (Bee? Sting much?) But it wasn't the first time I had thrown caution at least partially to the wind in pursuit of a shot, and I'm pretty sure I'll be at it again before long, too. For the record, no one - human or bee - was harmed in the taking of this picture. I was challenged by the relatively low light, gusty winds that kept shifting things around, and the decidedly chaotic flying of the little guy you see here. It's a wonder I got anything at all, and I'm already looking forward to next spring to try again. Your turn: This week's Thematic theme is size small. If you know how Thematic works, I'll say no more and let you get to work. If you're new to the Thematic thing, take a peek here to learn how it works. And if you want to reach out and give the little bee a (virtual) pat or two, I'm good with that, as well. Happy shooting! I hope you didn't really get stung! My garden is a mess at the moment, but there's a Size Small critter here. Now that is one bee-tiful capture Carmi! Here's mine fresh from this grey (ready to rain at any moment) morning! 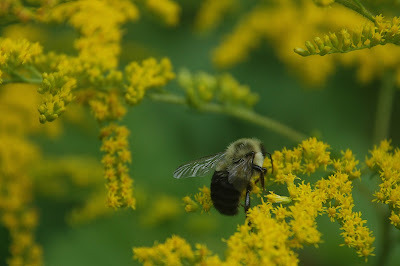 Great shot of the hardworking bee!